Well, it certainly has looked like Christmas around here lately! Snow, snow and more snow!!! We've had several snow days and now we are having to make up one day so far! But we've have fun in the snow....sledding, making snow angels, building snowmen, and yes shoveling snow!!! So let's get ready for the show...........it's the 12 Kits of Holidays time!!! 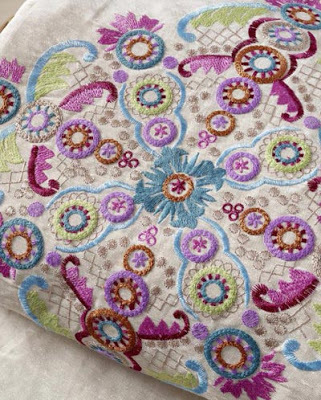 This month's kit was sent by none other than Renee Lynch of It's a Patchwork Life! And she went for a Country Christmas theme.......Love it! Thank you Renee for such a thoughtful kit! So my first card that I made with Renee's kit was this simple modern card. I LOVE this tree die by Memory Box. I think this tree is stunning with all it's little "pieces" left in place. That's it from me today but let's go check out what the rest of the group made with the Country Christmas kit!!! Make sure to stop by Renee's blog for full supply list!!! Welcome back!!! 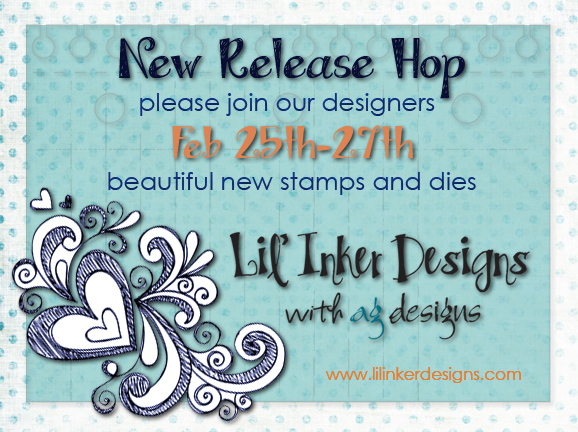 Today is the last day of the Lil' Inker Designs February Release! All of the fabulous products introduced over the past few days is available now HERE. We are still blog hopping to show off even more inspiration.......so you should have arrived from Alyssa's blog, if not start back over at the Lil' Inker Designs blog! 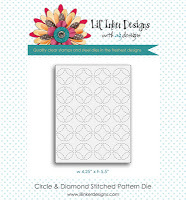 Today I am sharing a card using the Circle and Diamond Stamp Set and Die. I've used a funky color combination and came up with my pattern based off the challenge at Moxie Fab this week. (I totally had another project ready but it will just have to wait!) The trigger is a wonderful display of stitching in a fabulous pattern! What do you think of the larger sentiments that are included in this set? I LOVE them! Well, you're not done just yet......your next stop is Debby Hughes! Comments are still open for grabbing one of the 2 store gift certificates during this release. Remember if you are placing an order, there is a free mini stamp set that is yours with a $75 order!! Welcome back to Day 2 of inspiration with the newest products from Lil' Inker Designs! Now if you missed it, you need to go........no run to the Lil' Inker Store and snag these new goodies while you can! You should have arrived from Alicia Thelin's fabulous blog but if not, start back at the Lil' Inker Designs blog to get started! Today we're sharing inspiration using the Notebook Doodle Stamp Set and Notebook Die (concept by Alicia--DT). This set is super fun and there are seriously ENDLESS ways you can use this but especially for those kiddos and teens! I remember those days in school.....boredom=doodling! Would you like to win a gift certificate to the Lil' Inker Store? Well, all you have to do is comment along the way and 2 luckies will win a $10 gift certificate! 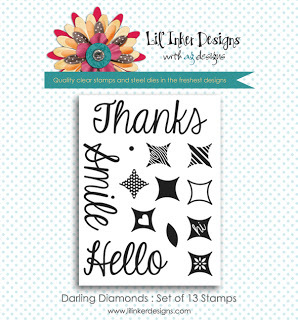 Don't forget about the other new little stamp set that is FREE with a $75 purchase. It's called Awesomesauce and it is an adorable mini saying set. Your next stop along the way is Debby Hughes! Thanks for stopping by! 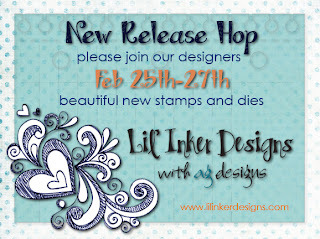 Welcome to the new release of Lil' Inker Designs!!! This month is "rockin'".....some seriously fabulous new goodies! We're sharing inspiration from the entire team this month. You should have arrived from Alyssa's blog, but if not start over at the Lil' Inker Designs blog HERE. Plus you'll want to check out who the newest DT member is! I already ♥ her! 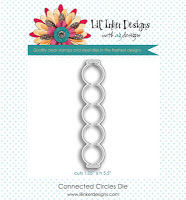 Today we are sharing the new Circles and Diamonds!! Oh. my. goodness. You will love these new products! SOO many possibilities with these! Need to insert a SHOUT OUT to one of my best friends....Jen Carter. She was the genius behind bringing these fabulous goodies to you! Congrats Jen and thank you! I love them! I've used the new Circle and Diamond Stitched Pattern Die on my background and stamped some of the pattern diamonds from the coordinating stamp set called Darling Diamonds. The sentiment is from a previously released set called You're Invited and is stamped on the banner die. You probably recognize the balloon dies from a previous release.....they are a must have! My next card uses the Connected Circles Die as a border. I first used the Stitched Pattern Die and then used the Connected Circles Die to die cut a strip for my border!!! Makes for a super simple card! Wait! I'm forgetting something! Look at this adorable little sentiment set that is going to be FREE with orders over $75!!! This is for a limited time while supplies last. Use the code AWESOMESAUCE at checkout!! Thank you all for stopping but before you go, you may just want to leave a comment as there are PRIZES up for grabs! Your next stop is the amazing Debby Hughes! It started this way: The Friday we were leaving for vacation, I was feverishly working on assignments for my blog that would be posting during vacation. I opened up my email to find a note from Julee Tillman. The VERVE diva herself emailing me???........what? Seriously, I barely had time to read the information before we left. So...during the drive to KC, I read the email again and again. I was and am still just in shock!!! Thank you Julee for truly making my day! So....my news is that I'm a VERVE diva!! 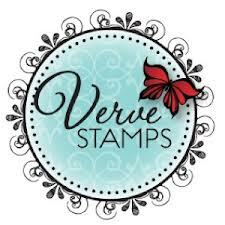 I've joing the group of fabulously talented ladies over at Verve Stamps as a Verve Inspiration Diva! You will be seeing Verve goodies from me throughout the month using my Verve stash to bring a fresh new spin on Verve that hasn't seen ink in a while! (there will be new Verve thrown in there too!) Beginning March 5, look for me to join the other inspiration Divas for the monthly blog hop!!! 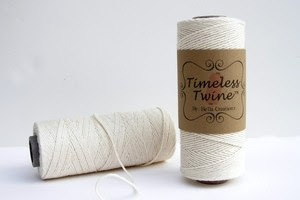 So today, I have my card that is up over at Timeless Twine today using their fabulous twine. My card uses wood butterfly veneers from Michael's (Thank you Erin for the heads up about these!) and I embellished them with Raspberry Lemonade Timeless Twine! An easy simple way to embellish these wood veneers is use twine for the body. The fun sentiment is from Verve's Make a Statement set. Thank you all for sharing in my news today! New stuff is coming to my blog later today from Lil' Inker Designs! Made with Love Blog Hop Winners!!! 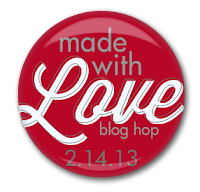 A quick post to share the Made with Love Blog Hop Winners! Before I get to the winners, I want to give a HUGE shout out to Lil' Inker Designs and Timeless Twine for their generous prize(s) for the hop! Not only these two sponsors, but all the other sponsors too! 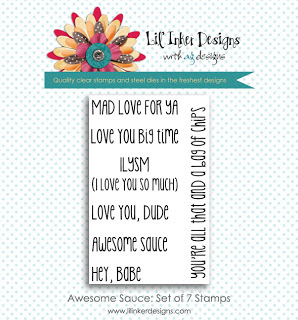 Lil' Inker Designs stamp prize pack WINNER: Virginia L.
Lil' Inker Designs $10 Gift Certificate WINNERS: Tracey McNeely and Brandi H.
Winners, I will be emailing you shortly......Congrats to you all and thanks for leaving such thoughtful comments!!! Hey there! It's no secret that triangles and chevrons and arrows are HOT right now. 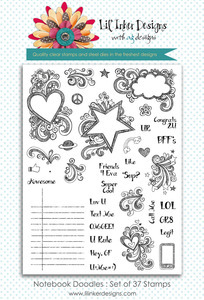 I made this for the release of Fresh Squeezed Stamps newest stamp set......Trendy Triangles! I just LOVE this stamp set and you will be seeing more of it.....GUARANTEED! 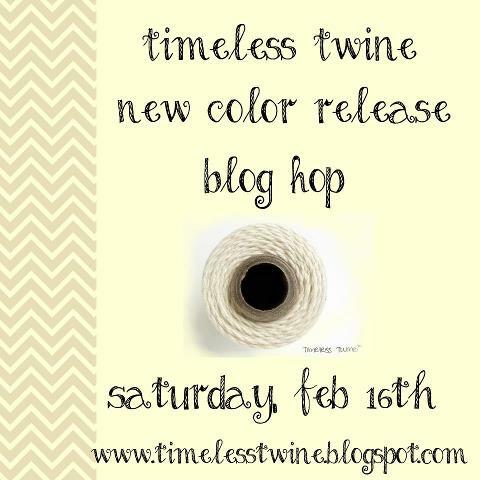 Welcome to the Timeless Twine New Release Blog Hop!! We have a new product to share on the hop today! We are loving our twine! You should have started over at the Timeless Twine blog.....if not, start there for the full list of participants! The new twine is NATURAL. Oh be still my heart! I've used it today to do a sweet little pillow box gift wrap! Easy peasy.....but look how much detail it adds to your gift giving! I've stamped various Medallions from Mehndi Medallions (Wplus9) and embellished with a white pen! Look at the added detail! Here is the new twine to drool over! Did I mention there were prizes? Well, let's continue along the hop and comment on all the participating blogs......there will be 2 spools of NATURAL twine being given away! 2. Leave a comment on each blog in the hop. 3. 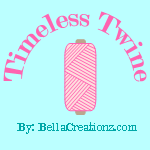 Follow Timeless Twine's blog. 4. Follow each blog in the hop. 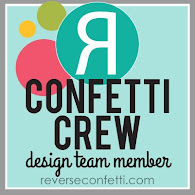 Your next stop on the blog hop is the sweet Amy T's blog: Tsuruta Designs! Hello Fresh Squeezed Stamps fans! I'm sharing a card I've made using some inspiration. 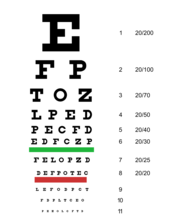 I'm sure most of us have gone to the opthamologist at one time or another......you know the Snellen eye chart? Well, that's where I got my inspiration from! My idea was a bit different but I LOVE how it came out! I've used the stamp set called Games People Play. I arranged all the letters on a block where I'd want them and stamped on scratch paper a few times to adjust the letters if needed. Made with Love Blog Hop! Welcome welcome!! What a fun post this is going to be! I'm joining the rest of the 2012 Paper Crafts Gallery Idol girls on a very special Made with Love Blog Hop! We are celebrating Valentine's Day today! You should have arrived from Jennifer Ingle's blog! You can see the entire list of participants HERE on our Facebook Event page! Each of us has created a fun Valentine project to share with you and then you have the fun of hopping along the hop! Guess what? There are PRIZES......Lots and lots of prizes! We have some AMAZING sponsors!!! 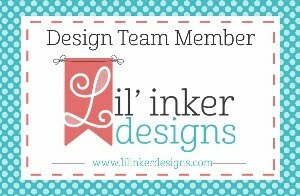 One sponsor today is Lil' Inker Designs! I am very blessed to be on this fabulous DT.....Laura is the sweetest person and someone I call a friend. I truly LOVE her products and she has wonderful customer service!! She is offering up TWO (2) $10 Gift Certificates AND a stamp prize pack! So that means......THREE (3) of you will be winners from my blog! Another sponsor is Timeless Twine! I just recently joined the team over at Twineology as a Twine-ista and it's been soo much fun! Twine galore and gorgeous beautiful twine colors! 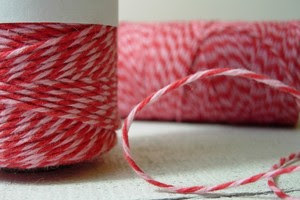 Stacy is offering up a FULL spool of her Valentine twine: Strawberry Cupcake just like what I used on my project today! So to win, I would ♥♥♥ it if you became a follower of my blog! However, I'm not requiring it....so you can just leave a comment below. There is no word verification, etc. :) You have until 11:59 EST on Feb. 21st to enter!! Here is the list of all the sponsors of the Made with Love Blog Hop! Thank you so much to these companies....make sure to thank them!! Your next stop is Agnieszka Malyszek's blog! Check this out.......a new die! As card makers, we spend a lot of time and put a lot of love into our cards. Then we get the gift ready for the party and what happens to the card? It gets put in an envelope and hidden away. Now with this new Card Hanger Die, you can proudly display your card, as your card AND as your gift bag decoration! If you love kraft colored things, like most crafters do, you have a stack of kraft gift bags ready to decorate. Just add the die to several bags and then you will be ready with a quick gift at a moments notice. Please check out Laurie's blog for more info on how to purchase this die and how to use it. Don't forget to leave a comment for a chance to win one of these card hanger dies. One winner will be randomly chosen from the comments on the 4 blogs!! Here's a close-up of the die and opening for your card! What's great about this die is that it will be awesome for those cards that have lots of big embellishments that make them hard to mail! What better way to show off your card than to hand deliver! My card uses a Notebook Paper embossing folder from Hobby Lobby and the Teacher's Apple stamp set. These would be so easy to make several at a time. Then you pair that with this new die.....LOVE! Remember.......Leave a comment for your chance to win one of these Card Hanger Dies that will be given away! One winner will be randomly chosen from the comments on the 4 blogs!! Sweet Stamp Shop February Release! Hi everyone! I am so excited to share that I am guesting over at Sweet Stamp Shop this month! The very sweet Nicole Rixon is having an awesome new release this month. 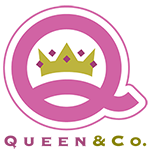 Have you checked out the new blog and logo? Love the design!!! Next up.....is a new background set that is right up my alley! Let's hear it for Distressed Chevron!! Oh I LOVE this stamp! I see this getting lots and lots of use in my craft room! Here I actually heat embossed the background although now I wonder why? hehe Anyway, using some diecut letters and layering make for a trendy look! That's all for me today but make sure to check the Sweet Stamp Shop blog for more inspiration using these new sets and other new sets as well! It's a big release, remember?